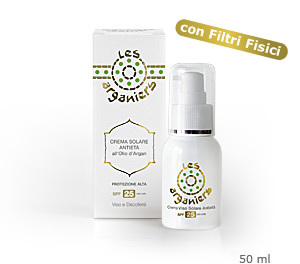 An effective sun protection with physical UV filter, zinc oxide, suitable even for sensitive skin and delicate. A formula rich in precious Argan Oil, Sweet Almond Oil and Aloe Vera that helps revitalize the skin to combat signs of aging and loss of elasticity of reinforcing, with argan oil, the capacity of protective sunscreens. For all skin types dl because you should always use a sun protection factor medium-high for the delicate skin of the face and décolleté. Results: Skin protected, moisturized, soft and supple. Fragrance: Soft and silky texture scented with pink grapefruit. As after sun, we recommend using Pure Argan Oil.